Editor's note: Franek graduated last year, but wrote us this post on a project he did while he was a graduate diploma student. This project is an example of a preventive conservation. 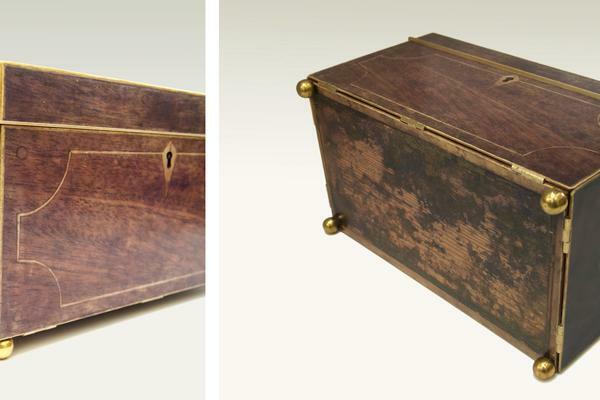 It didn't involve work on the actual tea caddy, but only making a box for it, in which the original piece would be kept. 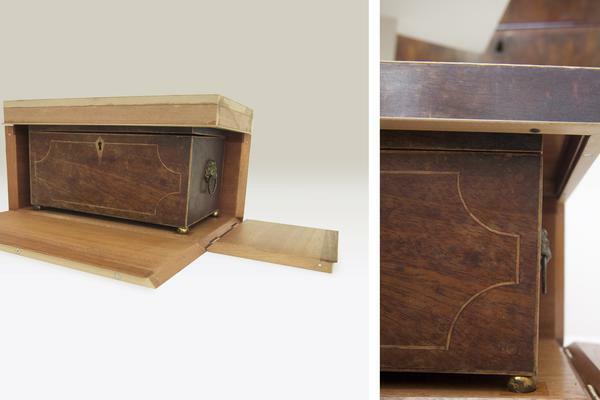 When the tea caddy arrived in our workshop it had a badly twisted lid with one of the corners lifting up to 9 mm. Unfortunately soon after the treatment to straighten the lid, which at the beginning seemed to be successful, the corner started to raise back again. 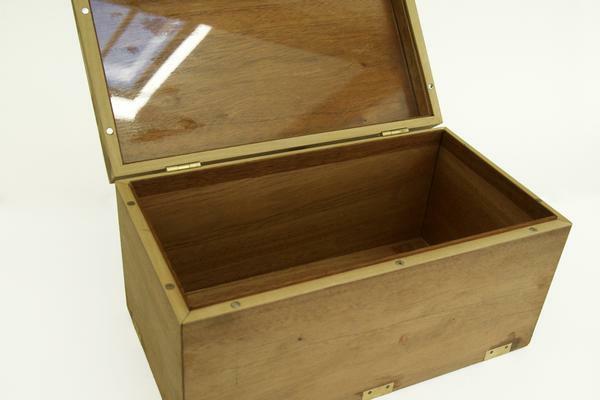 My tutor, Norbert Gutowski, suggested the idea of making a box, which could be used to put continuous pressure on the lifted lid, but could also be disguised to be a facsimile of the object. This project demonstrates a concept that could be useful in other situations, where a decorative housing is required to keep an object on display. In the design process of the box the main concern was function: pressure on a warped panel and an environment of fluctuating humidity can help to flatten the twisted lid. Second was safe and comfortable handling, and finally, the aesthetics of the box. Magnets solved the problem of closing the box as they allowed for an easy access to the original piece, without any unnecessary obstacles, i.e., opening a lock with a key, which could easily be lost. 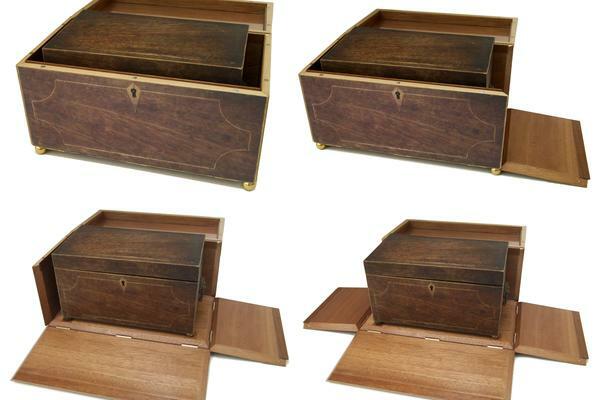 To allow an easy access to the tea caddy the front and sides of the box drop down-only the bottom and backboard are fixed. All vertical joints in the box are mitered. 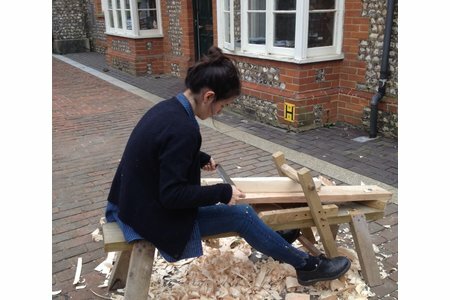 The fact of having used mitered sides influenced the idea of how the piece could be finished. Because none of the sides has fixed joints it was possible to apply photographs of the actual tea caddy on the box's side panels. This way the idea to not overshadow the true hero-the tea caddy-was achieved, and the box could stay only a functional piece. MDF boards (medium-density fiberboard) were used as a substrate for the box. To make them look more pleasing for eye they were veneered. When light-coloured mahogany was chosen the boards were veneered on both sides using a vacuum system. It was crucial that the boards would stay dead flat after veneering; otherwise, the open mitter joints wouldn't close properly. 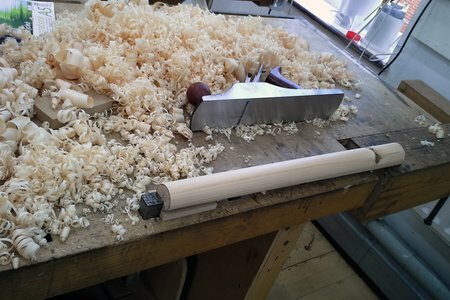 The first attempt using PVA glue (polyvinyl acetate) was unsuccessful, with ends of the 300 mm long veneered board cupping and twisting over 1 mm. Presumably the problem was the water content in the glue, causing shrinkage of the veneers. 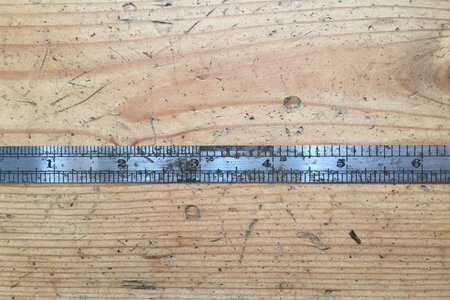 Because of the irregular density of the wood, shrinkage created uneven forces that led to cupping and twisting of the boards. As a solution water-free West System epoxy resin was used. 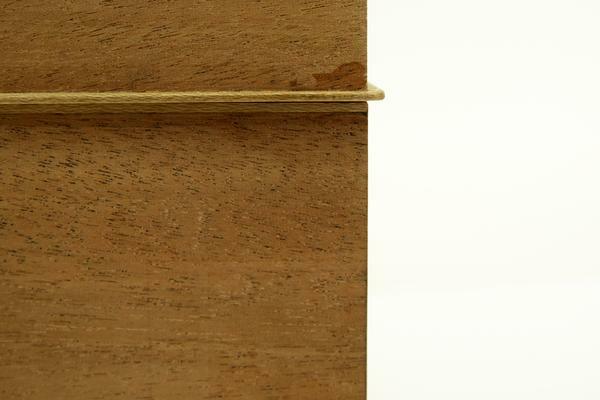 Mitered edges of the sides were also veneered to cover the MDF. 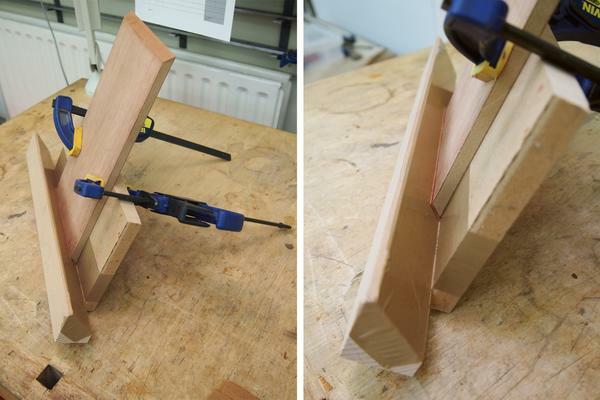 Special jigs were made, allowing easy and comfortable clamping when veneering. Neodymium iron boron magnets were used get the right amount of pull to keep the lid of the tea caddy down. 14 magnets (size 5 mm dia/5mmA) were put in, 7 in the lid, 7 in the case, each pair creating 0.8 kg pull to make 5.6 kg pull. The magnets are glued in drilled slots with acrylic resin Paraloid B-72. The bottom of the lid was fitted with a sheet of Perspex. It was added to protect the surface of the tea caddy from sticking to the inner surface of the lid of the box while being pressed down. 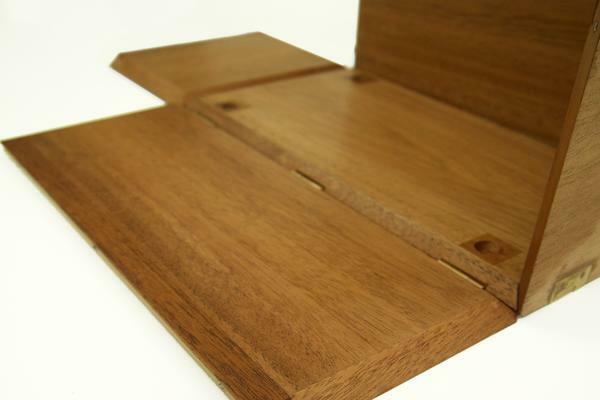 Lipping, made of holy wood, was made slightly wider on the lid than on the case to help opening the lid. It is widest at the corners, suggesting to the user a safe way of opening-with both hands holding the box and pushing the corners of the lid with thumbs. Mitered dropping sides are fixed with small magnets (pull 0.12 kg, size 3 mm dia/1mmA) for easier handling. This way, they can stay in vertical position without any help. Otherwise it could be hard to hold three sides closed while trying to put the lid down. 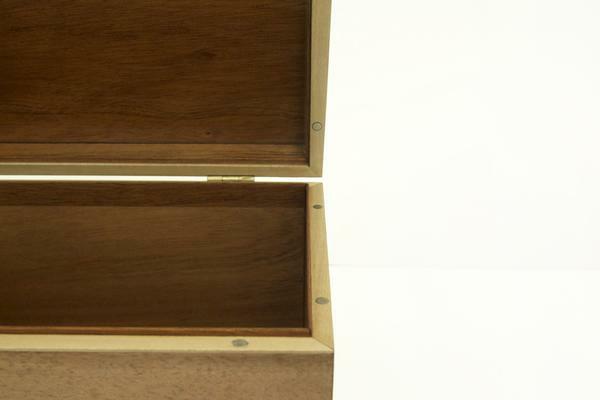 The sides of the box do not drop down while it is closed thanks to a small collar, also made of mahogany, around all sides of the case. 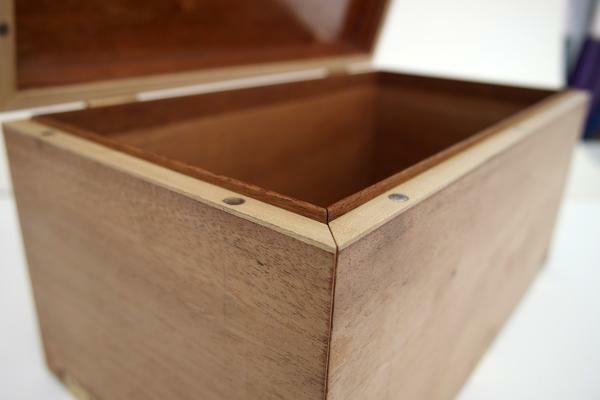 It is glued in the groove inside the lid flush with a rest of the surface. Inside the box, four square mahogany blocks with shallow holes drilled in them were inserted at the bottom board. 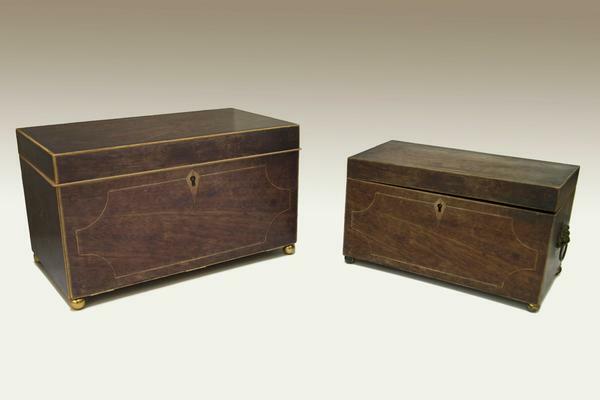 When the tea caddy is put into the box, the little bun feet sit in these holes. This has several functions. Firstly, because the tea caddy doesn't sit flat on a surface, each hole was drilled to specific depth is preventing the caddy from rocking. Secondly, as the caddy has a set place, it is always pressed with same amount of force. Finally, when the box is closed, the tea caddy is locked into place. That allows for a safe transportation from one place to another. 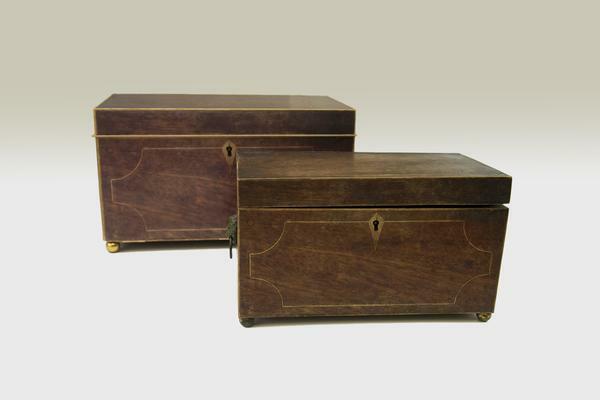 The box was finished with archival-quality photographs of the tea caddy glued on each side. After several tests, PVB (polyvinyl butyral) in acetone (15% w/v solution) was chosen as most appropriate. It has shown enough strength to bond paper to wood and, because of the fast evaporation rate of acetone, didn't damage the photographs. 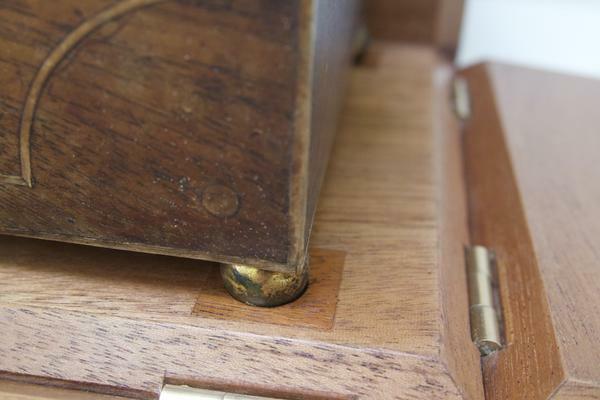 The final stage was to apply a brass bun feet similar to the ones on the real tea caddy.